Synopsis: A conman becomes governor of a local town run by a local mobster. LET THE BULLETS FLY is a Robin Hood-esque story set in the backdrop of 1920's China. We open with our Robin Hood figure, "Pocky" Zhang (Jiang), and his merry men, all conveniently named one, two, and so on, as they attack and take over a train of another conman, Tang, who is posing as a governor of a local town. The two con men band together to take over this town looking to make some quick cash, but has some opposition by local mobster, Master Huang (Yun-Fat), who is in on their scheme. And really, that's the basis of the plot which seems confusing, but I promise it's not. Three men trying to outwit and out con each other to be on top. However, the most surprising aspect of the movie was how funny it was. Director Wen Jiang could have easily taken the traditional Robin Hood dramatic take, but instead he takes a chance and makes the humor deadpan and dark. He has taken the typical archetypes from Robin Hood and has turned them into fun characters. Pocky is the conman with the good heart that knows his role in society, yet has created this band of men that has become his family. Master Huang as the overlord that stays in his tower and tries to create different ways to outsmart and run off Pocky. Then, probably my favorite, Tang, who is equivalent of a used car salesmen, but now is playing with the big boys. The three men have remarkable chemistry together that keeps you entangled in the silliness. One major flaw of the movie are the special effects. There's not much CGI within the movie; seems that Jiang wanted to keep to practical effects and stunts for about 95% of it. However, the few times there is an explosion or even rain, it appears that the studio hired the guys who work the Syfy network and create those Dino Croc movies. And no, even though to movie is very tongue-in-cheek and goofy at times, these effects were not on purpose. All the other location shots were gorgeous, and the CGI threw you out of the world the location created. Sometimes I forget how diverse film is. Usually when I hear this film or that film is from a certain country, I automatically jump to a conclusion of what genre the film will be. However, LET THE BULLETS FLY completely slapped that notion out of my head. 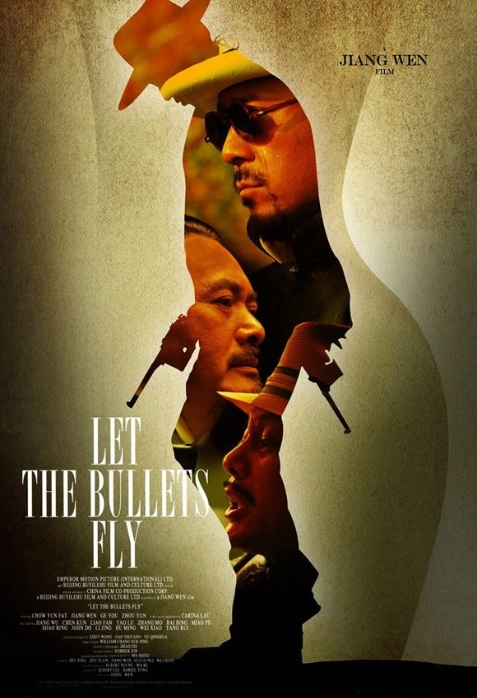 Even though the title lends itself to be a traditional Chinese action movie, BULLETS surprised me. Don't be completely fooled; there were a few fun action sequences, but those take a backseat to the fun and goofy tone that Jiang created.